It is pretty much common knowledge now that cigarette smoking can cause lung cancer. Most Americans are of an age that they've been told that smoking was harmful from early childhood from family and friends, throughout their education by teachers, and in public service announcements with General Surgeon warnings. What the public service announcements don't say, however, is that smoking may be worse for some people than for others. For example, not every smoker develops lung cancer. In fact, even though smoking is a major risk factor, only a small percentage of smokers develop cancer (Kiyohara, Shikarawa, & Hopkin, 2002). But then we also know that some people develop cancer from just being exposed to so-called second-hand smoke, or breathing the harmful trail of smoke off the burning tip of your mother's or friend's burning cigarette. Another scientific marvel that we've gained a lot of insight into over the past 50 years is the genetic code defines who we are: DNA. Understanding our genes, made of just four nucleotides abbreviated at G, C, A and T for guanine, cytosine, adenine and thymine, is extremely complicated. Every piece of us is defined by our 20,000 genes made by 3 billion base pairs. Many have wondered if we are formed by our DNA or our environment, and in so many ways we have found it is both. Our DNA forms who we are, but environmental factors affect genetic expressions to where they can bring out the best and worst in us. In regards to toxicology, our body tries to rid itself of toxic substances (xenobiotics) by metabolism and elimination of those substances. As it turns out, genetic variants, or polymorphisms, in xenobiotic enzymes can be protective or increase the risk of adverse outcome following toxic exposure. The xenobiotic enzymes and polymorphisms vary, as do the toxic substances, so the possible outcomes are difficult to predict in any one individual. Rate of metabolism can be a significant determinant, especially if metabolism of a toxic substance, or carcinogen, become activated or inactivated through metabolism. The cytochrome P450s are xenobiotic enzymes against toxic lipophilic chemicals, which incorporate an atom of molecular oxygen into the xenobiotic (Hirvonen, 1999). This makes the xenobiotic more water soluble, and prepares it for further metabolism. These enzymes are most densely located in the endoplasmic reticulum of hepatic cells (the liver) but also exist in many other tissues of the body. A specific cytochrome P450, known as CYP2A6, mediates 7-hydroxylation of coumarin and activates several nitrosamines including NNK, all carcinogenic compounds in cigarette smoke (Kiyohara, Shikarawa, & Hopkin, 2002). There is a genetic polymorphism in certain individuals that leads to less tobacco-related cancers. 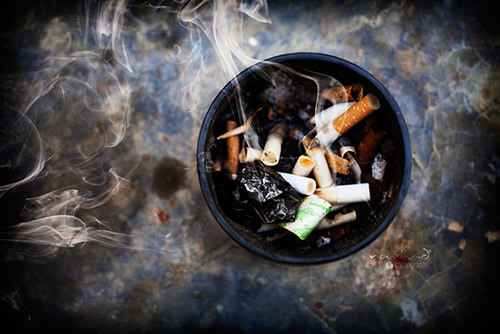 The causes appear to be because of less risk of (1) becoming addicted to nicotine, (2) those addicted to nicotine end up smoking less than others that are addicted and (3) decreased efficiency in activating tobacco smoke-derived procarcinogens such as nitrosamines (Rossini, de Almeida Simão, Albano, & Pinto, 2008). There are several alleles (genetic variants) of the CYP2A6 gene that have identified. One is the CYP2A6*4 slow metabolizer, which is most common in Japanese (20%) and Chinese (15%) (Raunio, et al. 2001). The slow metabolizer phenotype in the Caucasian population is rare (<1%). There is also an intermediate metabolizer phenotype due to heterozygosity of the CYP2A6*2 allele that is present in <3% of Chinese and Caucasian populations. Homozygous CYP2A6*2 alleles have no capacity of coumarin 7-hydroxylation. There are also rapid metabolizers, which could increase the rate of procarcinogen activation. Genotoxicity of smoking is much more complicated than just one genetic polymorphism, however. There are several thousand chemicals that have been identified in cigarette smoke, and at least 50 of them are known carcinogens (Kiyohara, Shikarawa, & Hopkin, 2002). Metabolism of each of them does not just consist of a phase I reaction through a cytochrome P450, but also a phase II reaction which also may have genetic polymorphisms that affect the overall carcinogenicity of smoking. Hirvonen, A. (1999). Polymorphisms of Xenobiotic-Metabolizing Enzymes and Susceptibility to Cancer. Environmental Health Perspectives. 107(Suppl 1), 37-47. Kiyohara, C, Shirakawa, T., & Hopkin, J.M. (2002). Genetic Polymorphism of Enzymes Involved in Xenobiotic Metabolism and the Risk of Lung Cancer. Environmental Health and Preventive Medicine. 7, 47-59. Raunio,H., Rautio, A., Gullstén, H., & Pelkonen, O. (2001). Polymorphisms of CYP2A6 and its Practical Consequences. British Journal of Clinical Pharmacology. 52(4), 357-363. Rossini, A., de Almeida Simão, T., Albano. R.M., & Pinto, L.F. (2008). CYP2A6 Polymorphisms and Risk for Tobacco-Related Cancers. Pharmacogenomics. 9(11), 1737-1752.